Many electric guitarists have recognized the value of ‘70s Japanese-made electric guitars from the likes of Tokai, Ibanez, Yamaha, and others, but acoustic players have been slower to appreciate the riches available from the era. In fact, Japanese guitar making had reached a peak during that decade, having perfected the mass production of quality instruments at a time when specialist tonewoods were still freely available—and just before production costs rose. This sent manufacturers and brand owners (not always the same things) first to South Korea and then to China, where the learning curve had to begin all over again. The Japanese acoustic guitar scene of the ‘70s isn’t an easy one to follow. "Who made what and for whom?" is an endless pursuit—and it does matter, because a brand could suddenly produce an unexpectedly superior instrument, having bought a particular model or series from one of the better suppliers. Where do you begin looking, when most of the published information is firmly focused on the major American acoustic makers? Well, there is information online, sometimes scrappy and sometimes contradictory, but that is something you have to get used to when researching Japanese guitars. Even some of the distributors of the big brands were never quite sure who was making which of their models, nor quite sure what they were going to get in the next shipment. Compounding that, 40 years later, memories can be unreliable, and what records there were may have been lost. The good news is that a small number of dedicated fans have worked hard to retrieve useful information, so Google is your friend. The prowess of some brands in this area is a given. More or less any Takamine is going to be good, and any Yamaha is going to be at least pretty playable and, at its best, world-class. Either brand really deserves its own article, as does Alvarez Yairi. 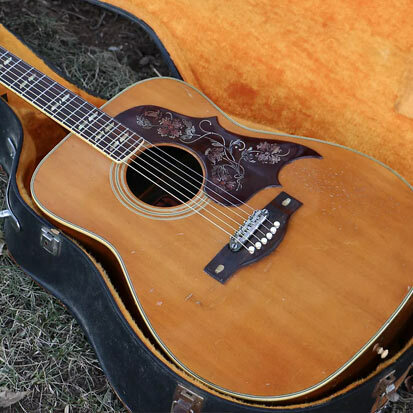 What we are looking for here, however, are the standout guitars from the less obvious sources that are worth tracking down—and that will repay the dedicated hunter with an individualistic instrument of surprising quality, and an instrument by now nicely played-in, aged, and, with a bit of luck, at a good price. This doesn’t pretend to be anything like an exhaustive list—there are many but-what-abouts that could be added—but it's intended more as a starting point of what could become a fascinating journey of exploration. Aria is better known for its solidbody electric guitars and some fine basses, and the brand name, if it is associated with acoustic instruments at all, tends to be pegged to beginner-level, nylon-strung, Spanish-style guitars, and some pretty forgettable dreadnoughts and folk models. 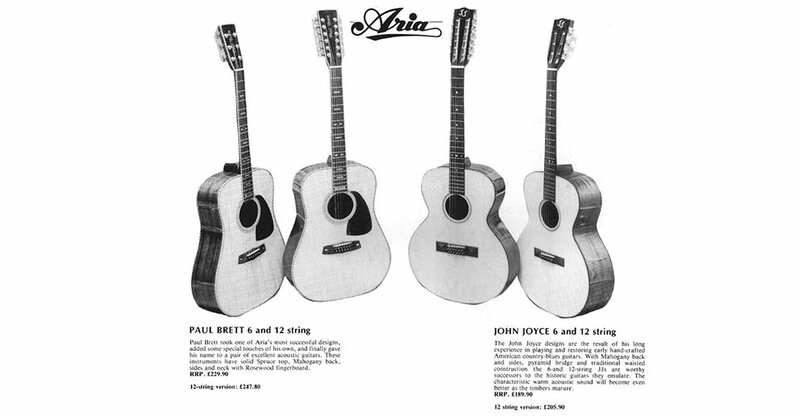 The two exceptions—actually four, as they came in six-string and 12-string versions—appeared in the late ‘70s as the John Joyce JJ and the Paul Brett PB models. Joyce and Brett were noted blues guitarists connected with Aria’s UK distributor, Gigsville, where Joyce was the in-house repairman. Gigsville wanted to offer high-quality Aria acoustics and introduced the two guitarists to Aria, which commissioned them to design six-string and 12-string signature models. The results were impressive. Aria Brett and Joyce ad. Featuring entirely solid woods, the Joyce and Brett models were like no other Aria acoustics before, leading to speculation that they had been made by one of the premier Japanese acoustic producers. In fact, recent contact with a former Aria employee in Japan confirms that they were produced by Matsumoku, the factory long associated with Aria instruments (and later with Westone and others). Matsumoku was known to be capable of producing some fine instruments but is really best known for its solidbody guitars and basses. The fact that these acoustics came from the same plant makes me wonder what else they produced, as they were known to provide instruments for other brands, including Washburn and Epiphone. The Joyce and Brett models were extremely well-made, great-sounding, and yet quite affordable. They were intended to be sold only in the UK, but in fact they seem to have appeared in other countries, too. 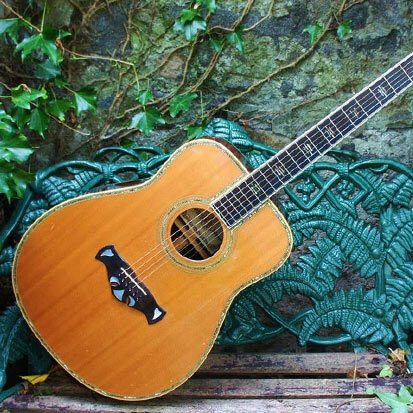 John Joyce died in 2004, but not before designing another Aria acoustic classic, the Sandpiper series, examples of which are also worth looking out for. Paul Brett is still very much with us, both as an authority on vintage guitars and a designer for the Vintage brand. By 1970, US guitar makers were starting to suffer from the inroads made into their home and international markets by Japanese guitars, which were no longer instruments to be laughed at (which, in any case, wasn’t always justified). Japan’s classical guitar makers had a distinguished history, but the first attempts to mass-produce electric and steel-string acoustic guitars for a mass market weren’t always very successful. It is Yamaha we have to thank for changing that. 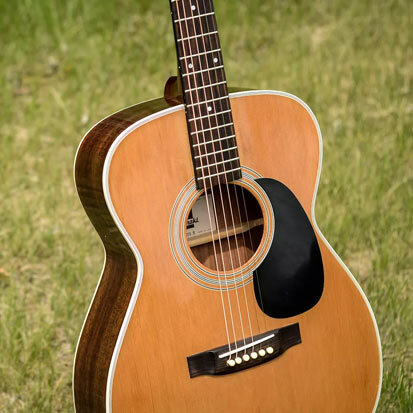 In the ‘60s, it produced the hugely successful FG models in its factory in Hamamatsu and went on to make professional quality acoustic guitars played at various times by Bert Jansch, John Denver, Paul Simon, Jimmy Page, and others. In the US, C.F. Martin’s response to the low-cost competition was a pragmatic "if you can’t beat them…" approach. 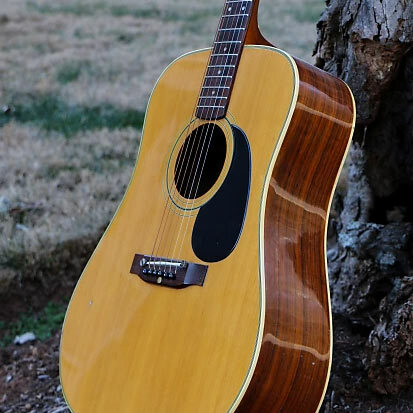 In 1970, it introduced the Martin Sigma range, which rapidly established a mystique around itself worthy of its association with the Martin legend. Vintage Sigmas from the early ‘70s are fairly hard to find, and some owners swear they compete on equal terms with Nazareth-produced originals. There are lengthy debates about serial numbers and plenty of fables about the materials used. Some claim the reason they sound so good is because they were made of all solid woods, which is not the case. In fact, most Sigmas had laminated backs and sides, and some even had laminated tops, too. Given how good a "First Generation" all-laminate Sigma Dreadnought can sound, this should give pause for thought among those who insist that only solid-wood acoustics can sound "right." Martin used various Japanese manufacturers to supply Sigma models, which were checked and set up in the US before sale. Manufacturers included Tokai and Kasuga, and while Tokai might be best-known for its much-loved solidbody Fender and Gibson clones, Tokai’s own Cat’s Eyes acoustics, which were effectively Martin copies, again with laminated backs and sides, are much sought after and often well priced. Look out for the Tokai CE-400 (D-28 copy) and CE-800 (D-35 copy) as good examples. Potential Sigma buyers need to do their research, because not all Sigmas were made in Japan (Martin had models made in Korea relatively early), and serial numbers and label styles are quite complex. Fortunately, the detailed information you need is available online. "Second Generation" dreadnoughts with solid tops are particularly prized and worth looking out for. Which Yairi do you mean? Trying to condense the complicated history of the Yairi family’s guitar making is beyond the scope of a short article, but suffice to say that both K. Yairi and S. Yairi, though related, ran separate companies. It was Kazuo Yairi (K. Yairi) who studied guitar-making in the US after learning his trade in Japan and then formed a partnership with the US distributor St Louis Music, which resulted in the famous Alvarez Yairi guitars—the brand name they were sold under in the US—while in Europe they were sold separately as K. Yairi and Alvarez. Alvarez Yairi, like Yamaha, really deserves a dedicated article, but as K. Yairi’s own guitars were less well-marketed and are highly prized, they are also worth tracking down. One in particular was a license-built model for Bozo Podunavac, the US-based guitar maker born in what at the time was Yugoslavia and whose ornately decorated guitars were and still are highly prized by collectors and serious acoustic players. Leo Kottke was a prominent Bozo user in the ‘60s and ‘70s, which boosted the maker’s profile. One of Bozo’s most popular designs was the Bell Western, and a small number of these were hand-built by K. Yairi in Japan, complete with the ornate design work. Later—and admittedly outside the general scope of this article—Yairi also license-built some guitars for George Lowden, and these, too, are much admired. Ah, but which Yairi? Some sources say it was Kazuo, others that the Lowdens were made by his uncle Sadao in a separate factory. This is just one example of the complexity underlying Japanese guitar collecting, though by no means the most confusing. Any K. Yairi guitar is likely to be expensive, but they are reckoned by their owners to be worth the money. Not exactly the choice for the bargain hunter (unless you are very lucky), but as good of its kind as it gets. Yamaki is not a name you see often, but now and then a Yamaki acoustic from the ‘70s will turn up, and when it does it is often a force to be reckoned with. Apparently, the Yamaki company is still in business today but concentrates on making guitar parts. What we are looking for, however, are acoustic guitars sold with the Yamaki brand name or, sometimes, with Daion. Yamaki may have been responsible for some of the fine Washburns of the era, too, notably the Prairie Song models, which are collectable and highly regarded. While on the subject of Washburn, and again as an illustration of how complicated it can be to get to the bottom of who made what, someone who worked at a UK guitar distributor recalls how occasionally he would unpack a new shipment of Aria acoustics, only to find that the guitars inside had the Washburn brand. Yamaki guitars were primarily in the Martin, Gibson, or Guild style, but the brand was dropped in the early ‘80s in favor of Daion. So any Yamaki-brand guitar is likely to be from the golden era and will be worthy of serious consideration. Happy hunting. About the author: Gary Cooper is a journalist working in the musical instrument and pro audio fields. He edits Music Instrument News (the UK MI industry trade magazine) and Acoustic Review. Gary also contributes to a number of other music magazines and websites. He lives in Sussex, England.